As a massive fire continued to ravage the historic Notre Dame Cathedral in Paris on Monday night, crowds gathered near the medieval landmark to mourn the destruction. The somber mood is palpable in the footage shared on social media, and particularly in a moving video of a group of presumed strangers near the landmark holding an impromptu vigil and singing "Ave Maria." The brief clip, captured and posted to Twitter by Spanish journalist Ignacio Gil, shows a small crowd of stunned and teary-eyed people standing on Rue St Julien le Pauvre just across from Notre Dame singing "Ave Maria" in French. It's a fittingly solemn scene that seems to distill the sense of heartbreak and loss that many around the world are feeling watching footage of the historic site burn. As of this writing, the Tweet had already been retweeted over 26,000 times. 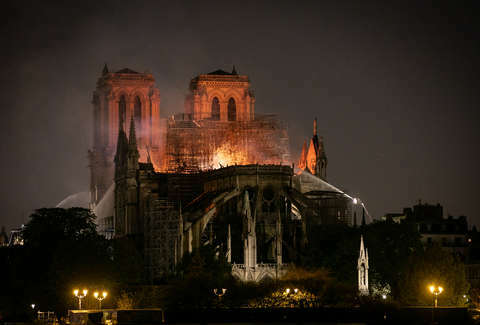 When the fire broke out Monday evening and quickly spread inside the iconic cathedral, it cloaked the city in an almost immediate sense of mourning. The smoke filled the sky and could be seen from all over Paris, and throngs of curious onlookers poured into the streets to see it. In footage that documents the moment the church spire and roof collapsed, cries of shock and horror can be heard echoing in the nearby crowds watching. While the cause of the fire is still unknown and the extent of the damage remains to be seen, it's become clear that much of the interior of Notre Dame is gone. Fortunately, there are early reports that crews were able to rescue a good deal of the sacred art inside before the flames could get to them, and that the structure itself may have been saved from total destruction. For now, though, this heartbreaking homage to the beloved site seems more than appropriate.